Despite the fact that I realize I’m adding to a glut of coverage right now, I can’t help myself. The sight of a new American spacecraft at our international orbiting outpost is a literal joy and no doubt represents the definitive space exploration moment of 2012. 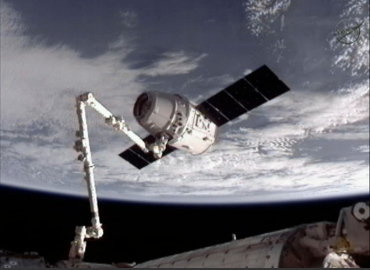 The Expedition 31 crew has recently uploaded a slew of new images of SpaceX’s Dragon spacecraft being captured and berthed to the ISS, a few highlights of which I’ve included below. Quite literally, the sun dawned across from the International Space Station minutes ago to reveal history in the making. 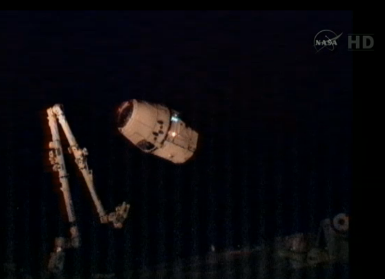 During a flawless night-time “grab,” Astronaut Don Pettit used the station’s robotic Canada arm to successfully secure SpaceX’s Dragon spacecraft. 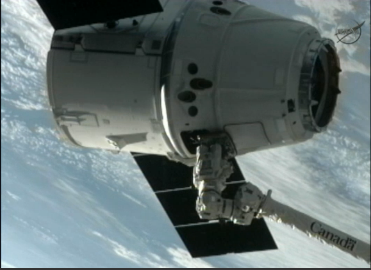 This makes SpaceX the first private company to launch a spacecraft into orbit and rendezvous with the station. Human history will never be the same. It is now living fact that entrepreneurs can leave our planet to seek reward beyond. -And a mythical dragon took us there. 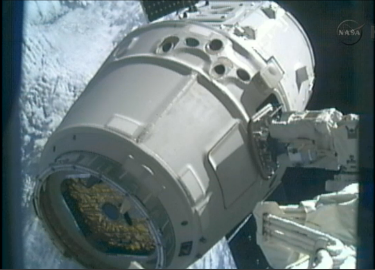 All looks well, and so-called “berthing” of the spacecraft (not to be confused with “docking,” which occurs under a spacecraft’s own power,) to the station should occur later today. 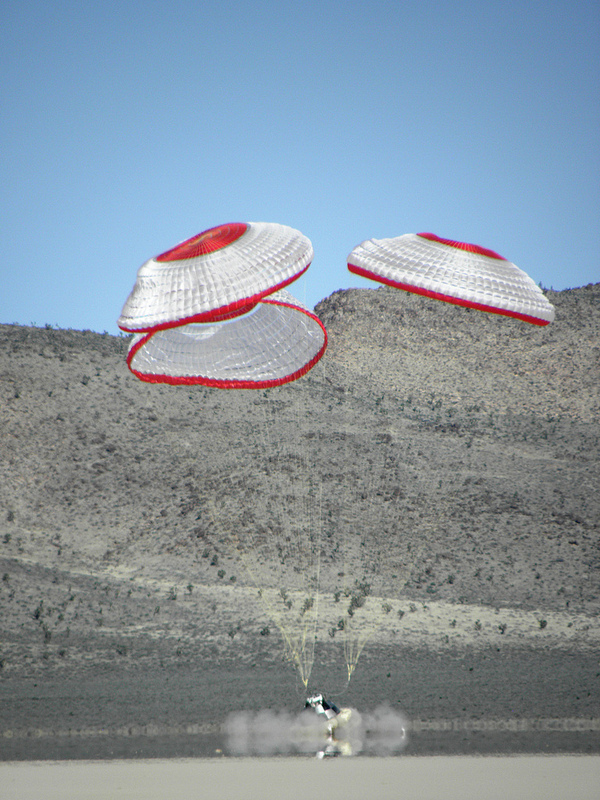 Aerospace giant Boeing and commercial space-station manufacturer Bigelow Aerospace, in cooperation with the Bureau of Land Management Ely District’s Caliente Field Office, conducted a relatively quiet spacecraft parachute drop test of Boeing’s Apollo-styled Crew Space Transportation (CST)-100 spacecraft this past April 3rd. The event, attended by local media and several bystanders, occurred over a remote playa in Delamar Valley, located 50 miles north of Las Vegas, Nevada. 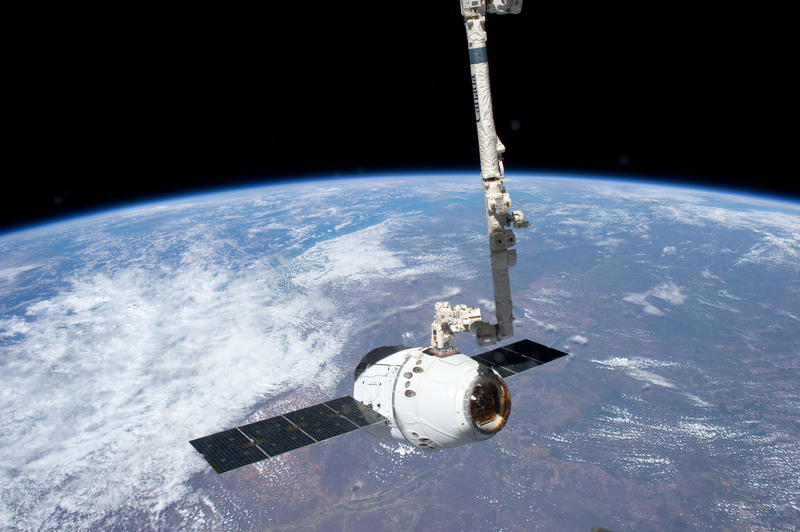 Aside from the fact that the test was a success and another commercial orbital spacecraft is that much closer to operation, (see SpaceX’s upcoming launch of their commercial spacecraft, Dragon,) most noteworty in my view is the fact that the event experienced a near-complete lack of media coverage. 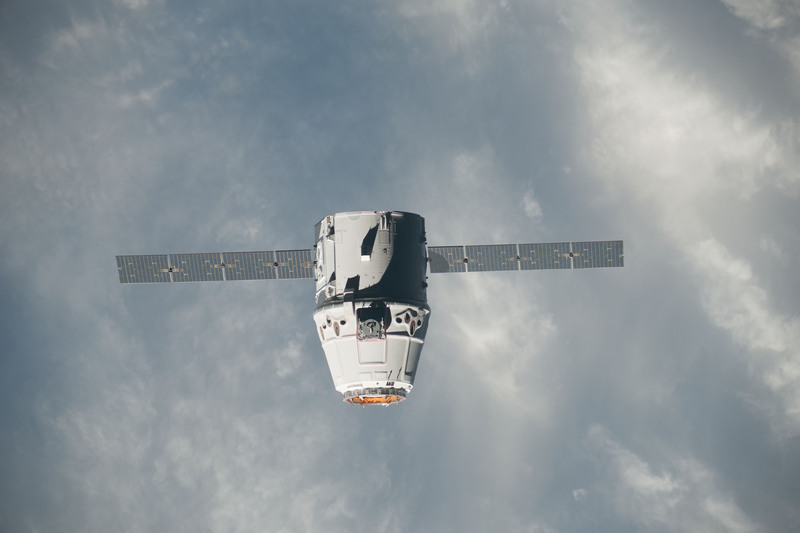 To me, this hints at the exciting, implicit truth that an increasingly hum-drum attitude toward commercial space events, (oh, another private spacecraft test,) seems to indicate that the commercial spacecraft market is becoming firmly established. -It isn’t necessarily “news” anymore. It’s (finally!) just reality. Welcome to the 21st Century. Using an Erickson Sky Crane helicopter, the Boeing-Bigelow joint test was carried out by lofting a test capsule to an altitude of 7,000 feet and releasing it, putting the parachute deployment systems through their paces under true field conditions. 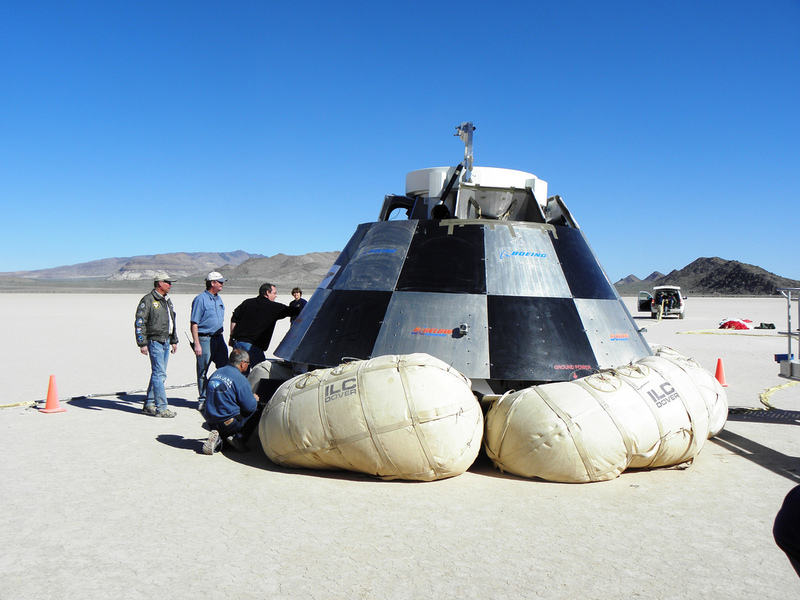 Additional tests scheduled in 2012 include a second parachute drop test, a series of landing air bag tests, a jettison test of the forward heat shield, and a hot fire test of the maneuvering and attitude control engine. For the complete set of photos of the successful test, click here for the BLM Nevada Flickr image collection. Let’s just say that’s where I was given pause. Of course it’ll be extraterrestrial resources, (as if the name isn’t overt enough,) but I agree – they’ll likely be going after nickel-iron asteroid bodies and platinum-group metals, to start. Why would I say so? Well, I calculated those very same numbers 13 years ago. Set the time machine back to 1999 for a moment. There, at the University of Wyoming, in the back corner of an undergraduate physics course, you’d find a couple of young, idealistic astrophysics majors ignoring the lecture on frictionless surfaces and discussing the problems that brought us there: Dark Energy, (though it hadn’t been named that, yet; it was the High-Z Problem at that time,) Dark Matter, and Space Colonization. Yes, one of these young scientists-to-be was yours truly. The other was one of my best friends (and future jazz compatriot), Chris Hackman. And it was there, in the back corner of that lecture hall, that I performed my first back-of-the-envelope calculations on harvesting the material in a single, mile-sized nickel-iron-rich asteroid. On its face, the number was in the trillions of dollars. I knew this was a rough number, an overestimate. -But even accounting for flooding the terrestrial nickel and iron markets, the number was still (literally) astronomical. It would more than pay for the cost of development, should only someone front the (we calculated) four-to-ten-billion dollars required to get the program running. Literally trillions of dollars of harvest-able material is waiting, ripe for the plucking, between the orbits of Jupiter and Mars, should someone only figure out how to get to it and bring it back. So, we decided to try and lay the groundwork ourselves under a non-profit science research institute I founded in 2002, called the Institute of Temporal Dynamics (now retired). 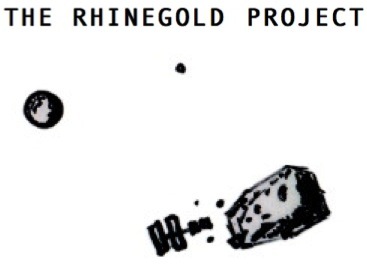 We called the project The Rhinegold Project. I rallied friends of mine to the cause: Aspiring chemical engineers; mechanical engineers; other geology students. We worked out orbital interception scenarios as well as in-situ harvesting architectures. And as far as we could tell, we were amongst the first to approach the problem seriously. Our Microgravity Centrifugal Smelter NASA proposal, ca. 2004. Our project matured as did our degree paths. By 2004, I’d switched to planetary geology and had taken the lead on an interdisciplinary college team to attempt the first in-situ asteroid-mining proof-of-concept for NASA’s KC-135 “Microgravity University” grant program. Our team? 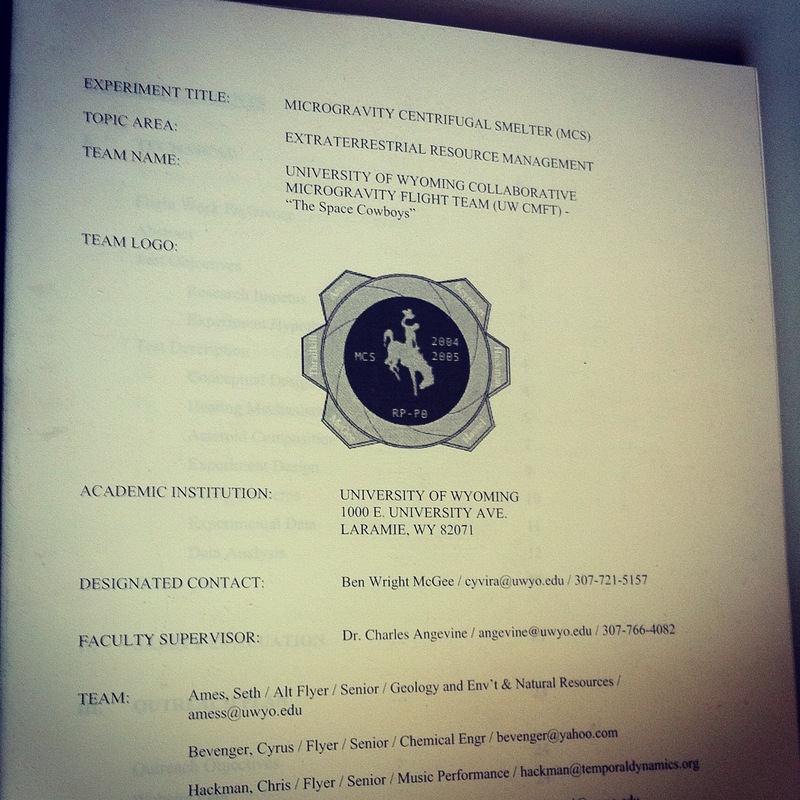 The UWyo “Space Cowboys,” and our project: the “Microgravity Centrifugal Smelter,” or MCS. The UWyo Space Cowboys then graduated and scattered to the wind. Well, my passions being what they are, I was never content to simply walk away from the concept of asteroid mining or MCS research. A recent paper for graduate school at UND last semester assessed the validity of the “gold rush” metaphor commonly invoked by proponents of asteroid mining, and at my spaceflight consulting firm, we’ve been trying to find ways to fund more modern incarnations of MCS research. The cost, as I mentioned earlier, will be truly astronomical. However, the reward may be equally as great. The good news? The finding of my recent asteroid/Yukon comparison paper is that on the frontier, cooperative competition is necessary for survival, so it seems there is room enough for all. The final analysis? Perhaps with Planetary Resources breaking new ground in the resources market, others will be made aware of the tantalizing possibility that asteroid resource operations present and decide to jump in as well. Maybe this is the start of the “21st-Century Gold Rush” many of us have been waiting for. I can’t wait to see what these guys are all about. I’m pleased to report that I recently had the fortune to represent my spaceflight consulting firm Astrowright as a sponsor of, as well as present research at, the Next-Generation Suborbital Researcher’s Conference this past February 26-29 in Palo Alto, CA. 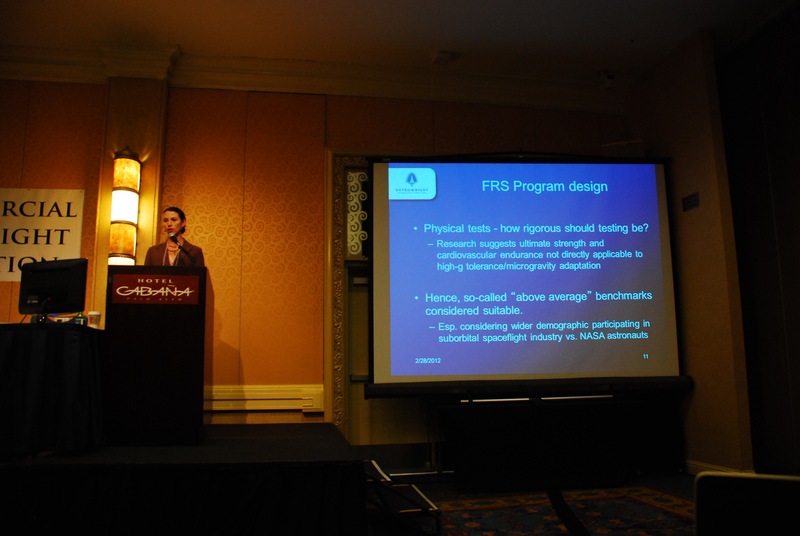 Ashley presenting our voluntary "Flight Readiness" certification service at NSRC 2012! Specifically, after nearly a year of research and client-training-data-mining together with my friend/ballet-dancer/anthropologist/excercise-scientist/astronaut-trainer/partner-in-crime Ashley Boron, our presentations centered this year on our frontier fitness services – Astrowright’s custom preflight fitness training program for space passengers-to-be and a “flight readiness” benchmark testing and certification program intended to help aspiring spaceflight pros demonstrate that they’ve got the Right Stuff. The three-day event was intense – with a flurry of presentations covering everything from spacecraft development and mental stress training to planetary science and research payload design. If that weren’t enough, beyond the research presented at the conference, (for the interested, the program is available here,) the meeting was an explosion of exciting commercial spaceflight activity, from keynote speaker Neil Armstrong’s comparison of early X-15 flights to the current activity in civilian spacecraft testing to XCOR’s giveaway of a trip to space! Unfortunately, I had only a single day to fly out there and fly back – one of the pitfalls of too many irons in the fire – but the experience in even that short amount of time, like the last one, was thrilling. 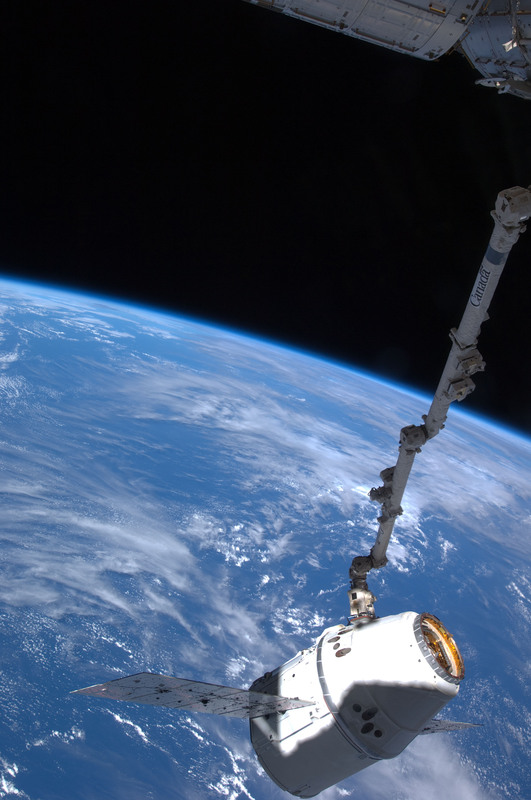 The conference smashed both attendance and support records, as well – Further evidence that the suborbital science community is nothing shy of a force of nature blasting the doors off the hinges of civilian spaceflight. Like many of us have been championing for a while now, a paradigm shift truly feels in-progress. 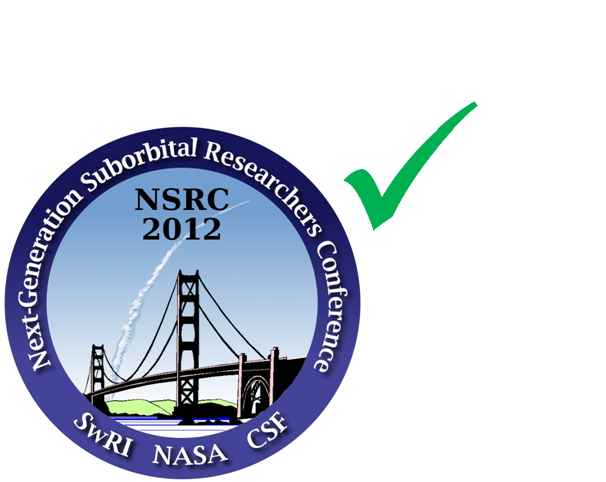 Many networking and potential research and business opportunities arose as a result of NSRC 2012… and I can’t wait to tell everyone about them at NSRC 2013! For more details on the conference and/or our presentations, visit the Astrowright company blog here. 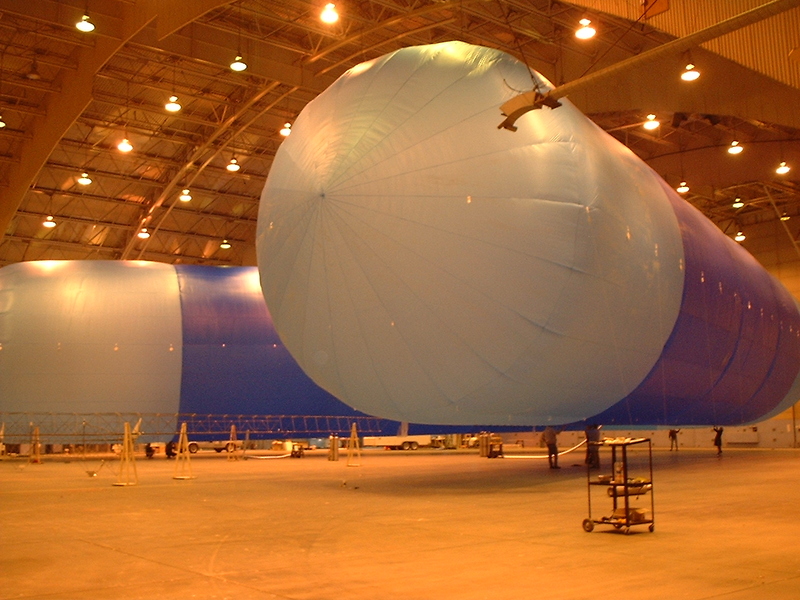 Airships: A century from prototype to spaceflight? Airships. There’s a certain nostalgic thrill to the streamline, art deco aircraft heyday that nearly was. 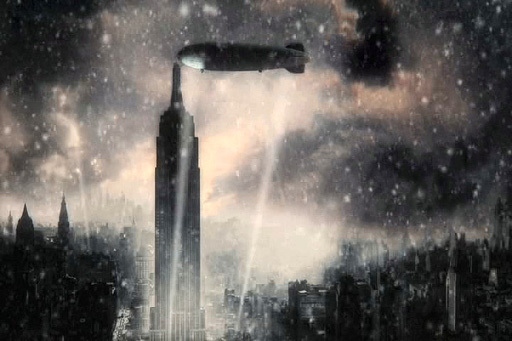 To the point (and as illustrated above): the Empire State Building’s observation tower was originally intended to serve as a mooring point for airships. Achieving the power of flight by harnessing a buoyant gas is simple, reliable, quiet, low-velocity, and (after shifting away from using an explosive gas) veritably safe. -And to many’s surprise, it might soon take us to space. 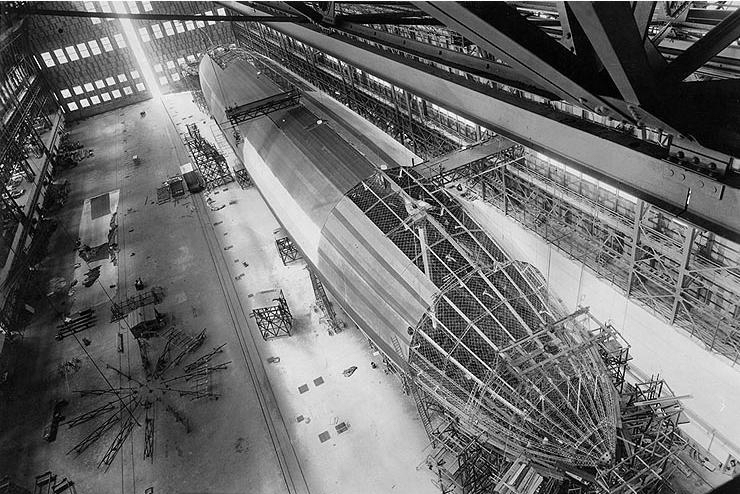 USS Shenandoah, U.S. Navy ZR-1, under construction in 1923. Many don’t realize that the United States had airships in military service, which were outgrowths of a German design reverse-engineered after World War I. For example, from 1922-1923, the first rigid airship, ZR-1 USS Shenandoah was constructed. Several subsequent military airships flew under the American flag prior to World War II until they became tactically obsolete. 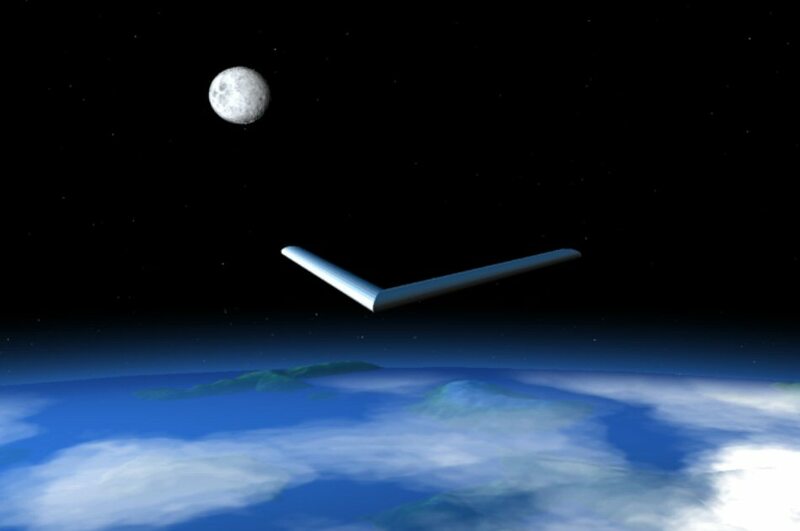 Now, after decades of work, volunteer-based aerospace firm JP Aerospace has its eyes set on an orbital airship as a gateway to the stars. How does it work? The system is essentially 180-degrees apart from the rocket-and-fanfare, minutes-to-space spaceflight that we’ve all become accustomed to. Instead, two separate classes of airships and a transfer station in-between slowly loft cargo to orbit over a matter of days. The process is something they call “Airship-to-Orbit,” or ATO. Essentially, an airship-to-orbit spaceflight program represents finesse versus conventional rocketry’s brute force. Though there are still engineering challenges ahead, JP Aerospace is powering through tests of their magnetohydrodynamic thrusters and are continuing toward a stunning run of 67 high-altitude balloon and sensor platform ascents. 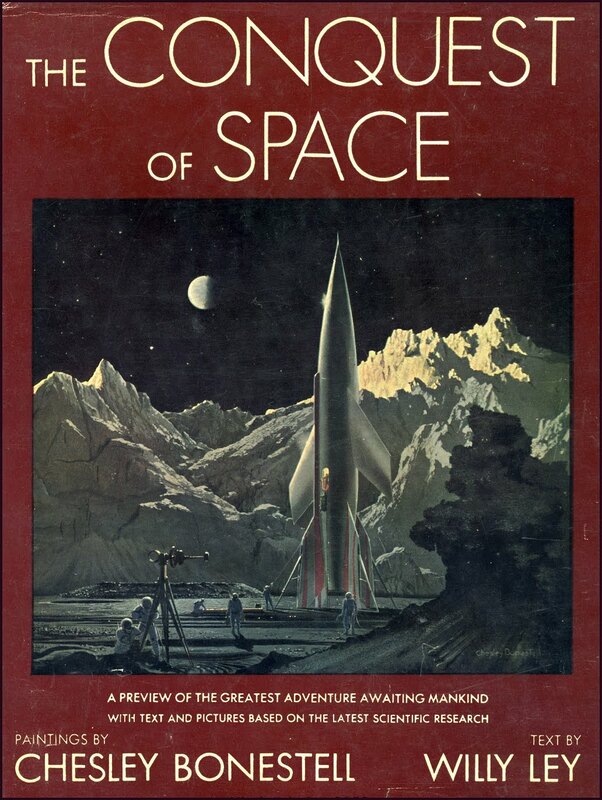 So, a century from prototype to spaceflight? It certainly looks possible. And if there truly is merit to the airship-to-orbit concept, based on how quickly JP Aerospace has been able to achieve flight benchmarks on a volunteer basis, then just imagine what could happen with serious backing by a government space agency. Personally, I love the architecture. There’s something about truly alien competition to conventional spaceflight providers that I think is sorely needed. As many who follow and support spaceflight are well aware, a Holy Grail of modern space transportation is the concept of the fully reusable rocket, or Reusable Launch System/Vehicle (RLV). Now, NewSpace orbital spacecraft provider SpaceX might just have this elusive target squarely in its sights. Many solutions have been suggested to achieve the true RLV space technology benchmark, which would herald a new era in space transportation by driving launch prices down at least an order of magnitude. However, only a very few of these designs have lofted from the drawing board, and none have yet been successfully implemented. Amongst these attempts are practically all of the famed, V-2 rocket-inspired Single Stage To Orbit (SSTO) concepts, such as those Vertical Takeoff, Vertical Landing (VTVL) rockets populating 1950s science fiction (right), as well as the Vertical-Takeoff, Horizontal Landing craft (VTHL) such as Lockheed’s Venturestar from the 1990s. 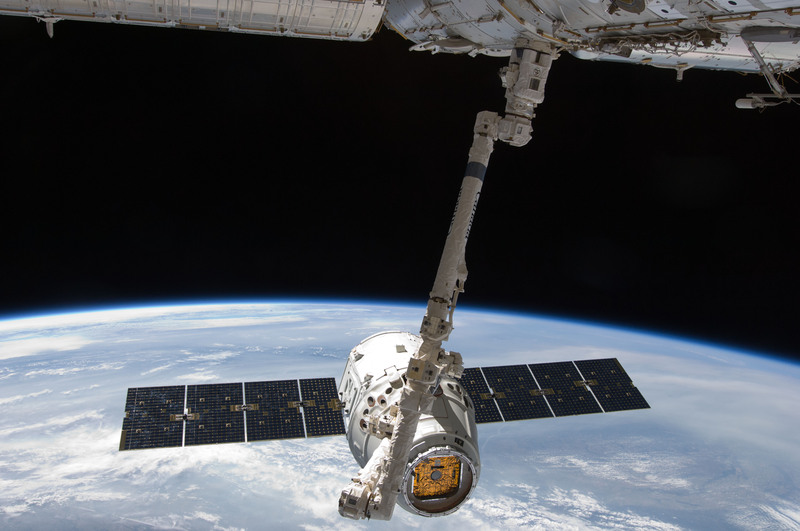 However, SpaceX, which has a cargo contract with NASA in-hand, is showing no signs of taking a breath prior to their first demonstration flight to the International Space Station later this year. 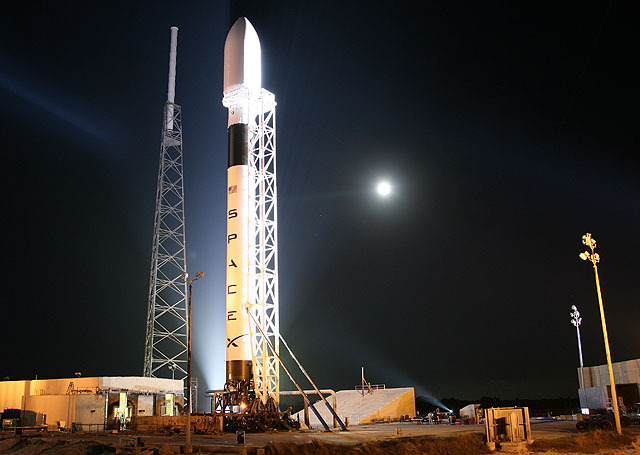 Instead of the traditional, expendable rocket stages typical of space transportation, SpaceX is aiming to make their Falcon 9 rocket fully reusable (and has been quietly doing so since 2009). This bears repeating. SpaceX plans to try and save their spent stages. In a draft environmental assessment filed last fall, SpaceX calls the first reusable stage of the Falcon 9 the “Grasshopper,” and proceeds to generally describe potential launch and testing operations to be conducted from a test site in the city of McGregor, Texas. The concept is simple. With a little extra fuel, forethought, and extendable legs, each stage could conceivably guide its own return for a powered landing (video available here). If successful, this forward drive from SpaceX could represent a watershed moment for conventional rocketry. Perhaps, should Grasshopper prove the viability of the RLV, it will no longer be seen as permissible or competitive by launch providers to waste spent rocket stages. Then, for the first time, we could see a substantial launch price shift along with the largest widening of the doorway to space since the 1960s. Keep your eyes on this one.